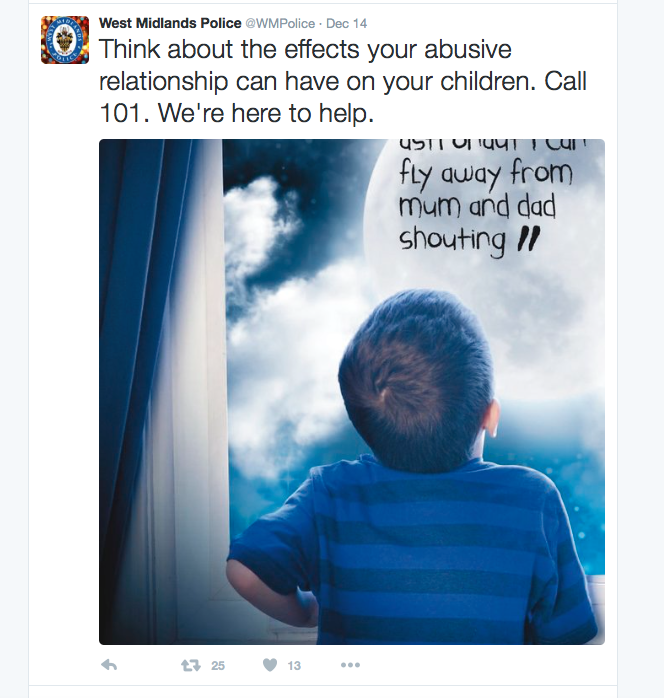 It's safe to say we were utterly appalled by this poster, which demonstrates a complete lack of understanding of the gendered dynamics of domestic violence and abuse (DVA), how perpetrators work, and insists the victim (almost always the mother) is equally culpable for the impact as the perpetrator. This is classic victim blaming of women and serves only to allow the perpetrator to elide responsibility for the consequences of his choices and actions. Because, the perpetrator of domestic violence and abuse is almost always male, whether they are the birth father, adopted father or stepfather. Domestic violence and abuse is a gendered crime, perpetrated by men against women and children. The statistics on this gendered nature are very clear, particularly when you count individual instances of physical or sexual abuse. The Office of National Statistics (ONS) actually caps the number instances of DVA that it records for a single person, almost always female, at 5. This means that a woman can experience an act of physical abuse every single day for a full year but only have 5 of those incidents recorded in the official statistics. These statistics do not reflect the pattern of coercive control that defines domestic violence and abuse. (w)hen this cap is removed ... violence against women by intimate partners rises by 70 per cent and violence against women by acquaintances by 100 per cent. It particularly affects those women who know, or even live with, the perpetrator. "unquestioning repetition of the 'one in four women, one in six men' statistic has serious side-effects." It results in local authorities using a 'gender-neutral approach' to provision resulting in decreases in provision for women, whilst simultaneously creating provision for larger numbers of men than actually need the services. It results in police campaigns that blame the victim for the consequences of the perpetrator's choices and actions, which in turn make it more difficult for women to report their experiences to the police. After all, how can you trust a police service that tells perpetrators that their victims own 50% of the responsibility for their crime? To be clear, once and for all: there is NO SUCH THING as an 'abusive relationship'. There are perpetrators of domestic violence and abuse who make a choice to engage in coercive control and use physical, sexual, and financial abuse to maintain the psychological and emotional abuse of their partners and children. Using the term 'abusive relationship' implies that both partners are equally responsible for the abuse. The ONLY person responsible is the perpetrator. Domestic abuse has a serious effect on children in the household in a number of ways, either the abuse spreads to the children, or they are psychologically affected by the abuse they see and hear. 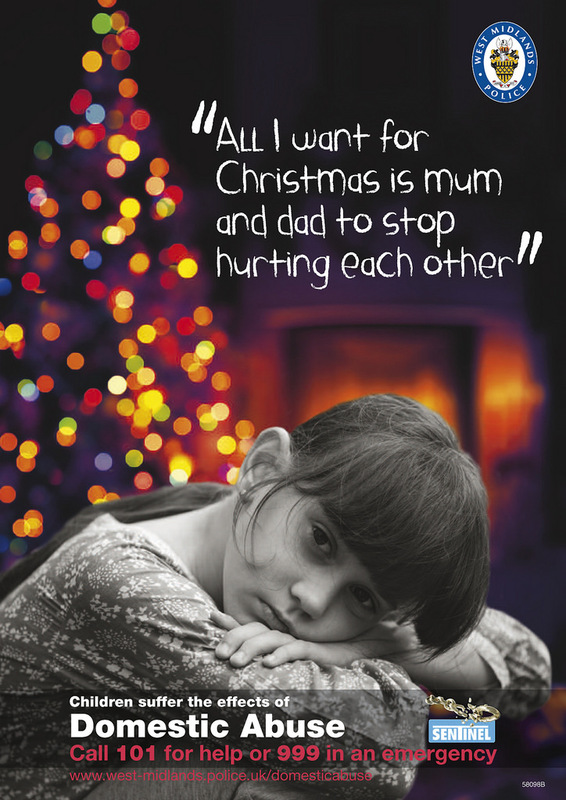 A campaign has been launched to focus on the emotional effect domestic abuse has on children and appeals to parents to consider the effect on their children as an additional reason they should seek help. 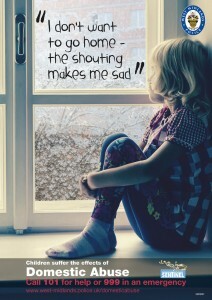 However, the person responsible for the emotional effect on children is the perpetrator. 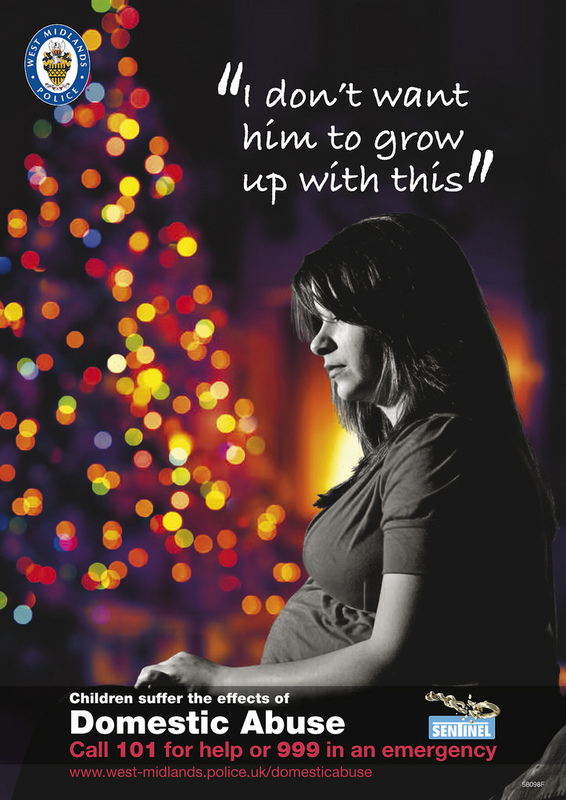 The other three posters in the campaign are variations on the same theme, although this one fails to mention that 1/3 of domestic violence and abuse either starts or increases during pregnancy. Recognising the increased vulnerability during pregnancy, and after the birth of children, demonstrates the male entitlement and privilege that underpins violence against women and girls. Failing to recognise the gendered nature of domestic violence and abuse puts women and children at risk. It impacts on the types of services funded by local and national authorities and it excuses the consequences of a perpetrator's choices and actions. Domestic violence and abuse does not exist in isolation from other forms of violence against women and girls and we need police media campaigns to reflect this. We need police officers trained by appropriate specialists to recognise the gendered dynamics of domestic violence and abuse. The fact that this campaign was developed and produced does not give us confidence that West Midlands Police understand or recognise these dynamics. *Radford & Hester, Mothering through Domestic Violence, 2006. West Midlands Police Force outs themselves as just another male supremacist organisation!! 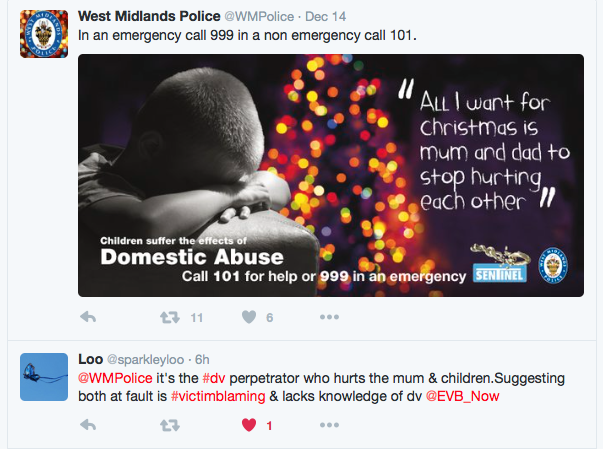 Well done West Midlands Police for your latest male centric women-hating campaign. Must never ever hold men accountable for enacting their male choice and agency to commit intimate male terrorism against women and children! The anger portrayed in the response mirrors mine. I don’t know one female who has hit back when attacked physically by her male partner . 99 percent of all females I befriend using an outside service as I. Tell me they have been in a relationship with a violent man who has not only damaged them emotionally but physically aswell. 99 percent. It frustrates me that men can be such creatures and nothing is being done to make the list of victims decrease. I know a neighbour who’s child disclosed to me, but because I know family courts push the Perpertrator to have regular unsupervised contact. I chose not to report it. As I would hate them and their siblings to be put in a high risk situation, like mine is. Domestic abuse isn’t a couple falling out or dad coming home drunk and hitting mum. It’s not the sound of glasses or plates being smashed or doors slammed. Dad getting stoned while mum cries in the kitchen and the children told to go to their rooms. It’s George seeing mums big bruise and her falling over when she’s been laid out on the floor for half an hour. Standing staring into space while he tells her what he’s been doing at school. As he watch her bite her nails or pinch herself. Scared about dad coming home from work. Wondering what will happen next. Waking up in the night screaming when dad goes away to work. Looking up at his mum and wondering why she isn’t happy. Why he hasn’t seen her laugh in ages. Why meals aren’t what they used to be. Not hearing her sing in the shower anymore. She stays up late most nights. He wants her to be happy again. He sees a glimmer of hope. Then she’s looking at her phone frowning. And he doesn’t understand why.